According to the International Organization of Motor Vehicle Manufacturers OICA, French automotive production increased 6.5% in 2017, while domestic registrations or sales of new vehicles rose 4.7%. French carmakers, which have a 59% market share in France, recorded a 14% sales increase, benefitting from growing domestic and international demand. In H1 of 2018 the robust performance continued, with domestic automotive sales increasing 4.7%. The utility vehicles market performed well, partly driven by a rebound of the construction sector. Automotive parts and components manufacturers’ revenues are expected to increase 3.5% in 2018 after growing 6% in 2017. Automotive suppliers are impacted by the decrease in diesel vehicles production and have therefore launched measures such as new R&D, innovation and investment plans in a shift to provide components for more environmental-friendly engines as well as connected and electrical vehicles. This requires large investments, and it helps that banks are currently willing to provide loans to this segment, which is already highly dependent on bank financing (both short- and long-term debts). Despite the unfavourable impact of rising commodity prices and higher staff costs automotive suppliers posted good margins in 2017, with average earnings before interest, taxes, depreciation and amortization (ebitda) at 5.7% of revenues. That said, structurally the margins of suppliers remain under pressure as the powerful car manufacturers keep requesting greater productivity, coupled with lower prices (e.g. many suppliers could not pass increased metal prices on to OEMs). 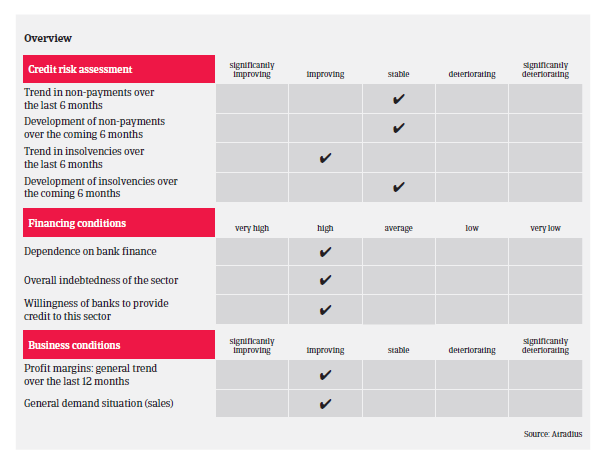 Despite the ongoing upturn, major structural issues persist (high working capital, investment requirements leading to high debt levels and financing needs, coupled with strong competition and price pressure). Any demand downturn in the future could seriously affect suppliers, especially those who are highly geared and positioned at the lower end of the value chain. 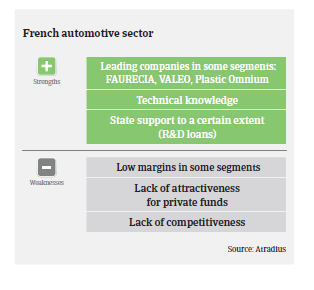 On average, payments in the French automotive industry take 60 days (end of month). Timely payment is important, and there are few protracted payments. The payment experience has been good over the past two years, and we do not expect any fundamental change in the coming months. Insolvencies decreased in 2017 and the insolvency level is expected to remain low (below 1.5%) in 2018. Usually the assets of defaulting companies are taken over by other suppliers, sometimes supported by a car manufacturer in order to avoid disruptions in the supply chain. 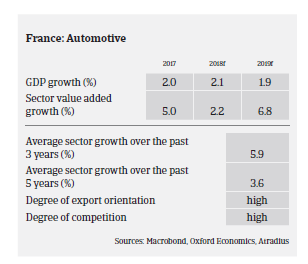 Given the solid performance in 2017 and the positive business outlook for 2018, our underwriting stance for the French automotive industry remains generally open. We expect that the impact of any US import tariffs on French carmakers and suppliers would be limited as the export share to the US is very low, with no change in credit risk for the industry. 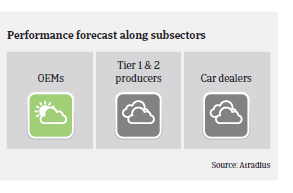 OEMs and Tier 1 suppliers retain a strong risk profile, posting robust revenues and margins, For Tier 2 suppliers our underwriting stance is more neutral, as this segment remains impacted by changes in raw material prices and pressure on margins from OEM/Tier 1 businesses. Businesses in the Tier 2 segment remain susceptible to higher risks, as the trend to outsource production overseas and high competition from foreign companies has led to overcapacity. We closely monitor smaller suppliers engaged in foundry work, small stamping and/or producing items with low technology requirements. We also maintain a neutral underwriting stance for car dealers, as this segment suffers from decreasing demand of diesel cars and could therefore face significant inventories.